Cute boy looking for forever home or temporary foster home! Miles is a 3-year-old (born 8/6/15) 20 lb. 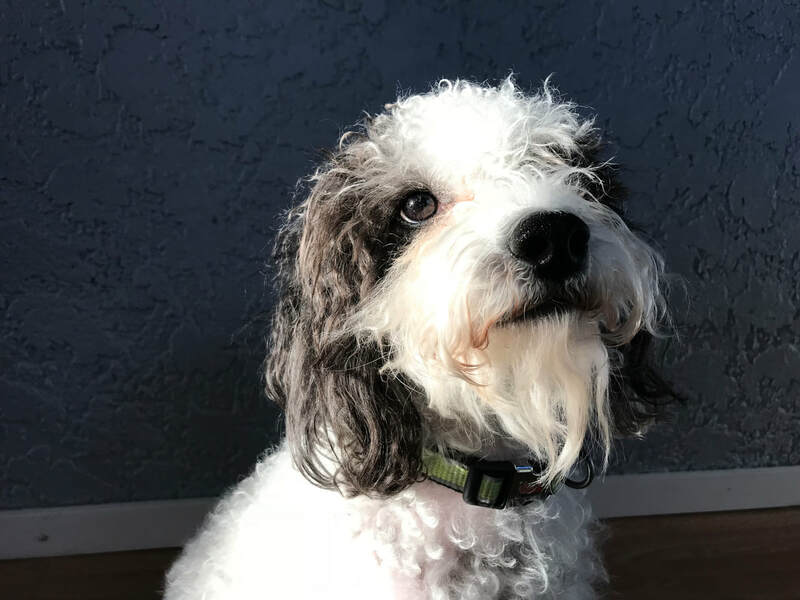 black/white poodle mix. Our family adopted him from Colorado Mill Rescue in early November 2015. He was a great puppy. As he got older he began to bark excessively and became harder for us to control on the leash so we sought out training to help curb the unwanted behaviors. He went through two weeks of board training in the summer of 2017 after attending a different training session in winter 2016. He understands the following commands: down, lie down, come, inside, out, outside, huggies, up, heel, drop and no. Miles loves to go on run/walks and snuggle. He cannot get enough physical attention and is a loyal and devoted friend. He adores attention from both men and women but prefers women. He loves to play with balls and go for rides in the car. Miles is kennel-trained (we have been locking him up when we leave the house) but sleeps in our room on his pillow at night without issues. Miles loves to be groomed and he sheds very little. He has always been current on his vaccinations and has never had any physical conditions or injuries. Miles started resource guarding our children's socks, shoes and toys in Fall of 2017. He started marking in the house in Spring of 2018. He will act extremely aggressive if he can get an item into his kennel (which he can unlock with his nose). He is a very smart and opportunistic dog. Miles will attempt to bite while resource guarding. He growls, barks and bares his teeth but will not charge. For more information and/or to apply to adopt Miles, go to the top toolbar, click Adopt, click Dog Application; then fill it out and send it in. A volunteer from Summit Dog Rescue will get back to you as soon as they can.